Here’s BMW’s latest commercial for the 2012 M5, showing the 418 kW (560 hp) monster saloon at play on seemingly-endless salt flats. Recreating the familiar super slow-motion bullet footage on a much grander scale, BMW classes ‘Bullet’ as High Performance Art. We just think it’s pretty cool. 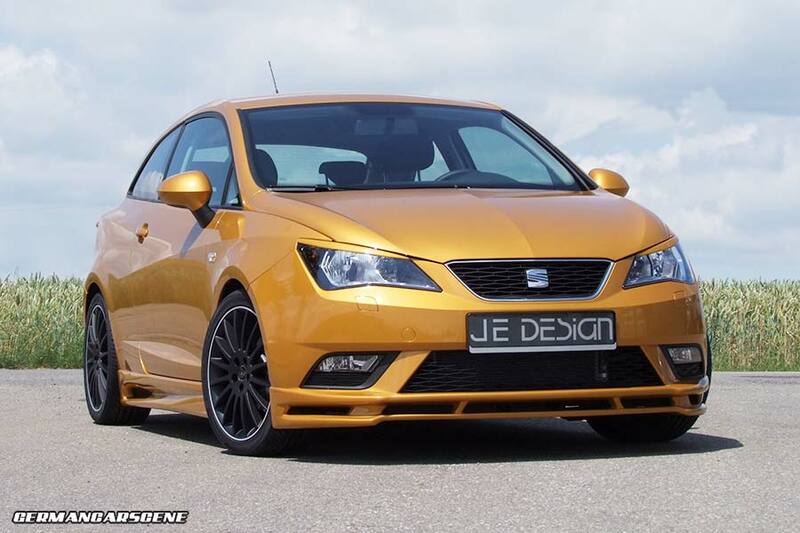 Leingarten-based styling specialist JE Design has revealed new options for both the three and five-door SEAT Ibiza (6J) models. Constructed from ABS plastic, the aero package is priced at € 1,238 and consists of a front spoiler, headlight covers, side skirts, roof edge spoiler and carbon fibre effect diffuser section for the rear bumper. There’s also a version for the Seat Ibiza ST station wagon – minus the roof spoiler, for € 1,099. The trapezoid tailpipe will set you back a further € 399. Other components on offer include a -35 mm suspension spring kit for € 149 and a range of alloys, in sizes 7 x 17 to 7.5 x 18-inches, including the company’s new five double-spoke Scorpio wheels for € 2,380 a set. For owners in search of extra power, JE can also provide its performance kit. The 1.6-litre TDI jumps from 77 kW (105 hp) and 250 Nm of torque to 93 kW (125 hp) and 295 Nm, while output from the 77 kW (103 hp) 1.2-litre TSI rises to 103 kW (138 hp), enough to slice 0.7 seconds from the 0-100 km/h time. Prices (inc fitting) are € 1,099 for the TDI and € 1,399 euros for the TSI. Further conversions are in development. Audi has revealed that its R8 e-tron has broken Nurburgring’s lap record for a electric production car, with Markus Winkelhock travelling around the 20.8 kilometre (12.9 mile) track in just 8:09.099 minutes – a mere 5 seconds behind its 4.2-litre V8-engined counterpart. A T-shaped 49 KWh lithium-ion battery, mounted within the central tunnel, feeds the pair of electric motors generating a total output of 230 kW (308 hp) and 820 Nm (605 lb/ft) of torque, with around 490 Nm (361 lb/ft) transferred to the rear wheels from a near-standing start. A range of 215 kilometres (134 miles) is possible, with energy recovery during coasting and braking also providing a charge. The utilization of aluminium and carbon fibre for the car’s construction helps to keep weight to a minimum, however, at 1,780 kg (3,924 lb) the large battery means it’s 220 kg (485 lb) heavier than the R8 V8. Performance is still impressive, with 100 km/h (62 mph) happening in just 4.6 seconds and, while top speed is normally governed to 200 km/h (124 mph), approval was given for this figure to be raised to 250 km/h (155 mph) for the record-setting lap. Times of 8:30.873 and 8:26.096 were achieved with the speed limiter activated. “The record drives were a fantastic experience for me. Of course, the R8 e-tron is a production car, not a racing car with the assistance of aerodynamics. But with its low centre of gravity and rear biased weight distribution, it brings with it a lot of sporty qualities. The torque with which the electric motors propel the car uphill beats everything that I know,” said an elated Winkelhock. 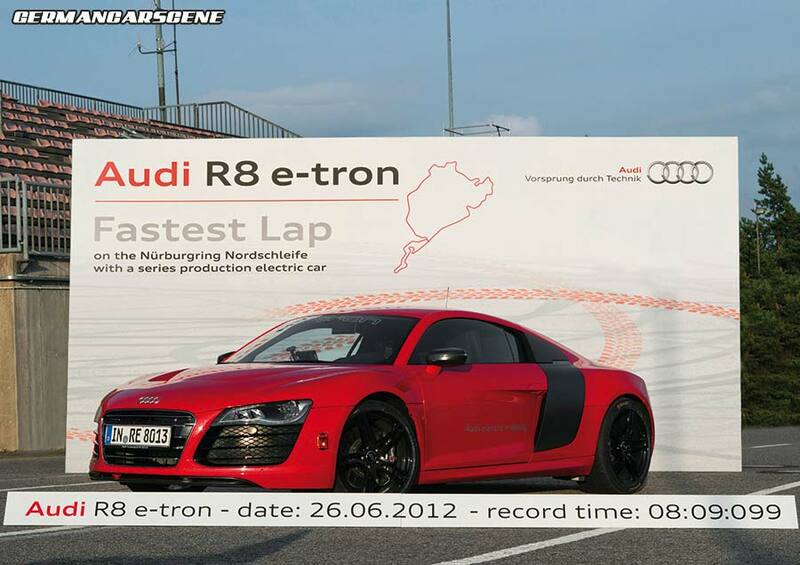 It is believed that the R8 e-tron will become available by the end of the year at a price of around € 200,000. Here’s a new video from the professional freeskier and alpine ski racer, Jon Olsson, showing the Swede having some fun in his supercharged 529 kW (710 hp) PPI Design R8 Razor GTR along with a friend in a 466 kW (625 hp) Lamborghini Gallardo LP 570-4 Superleggera. The pair were enjoying ‘Extraball 2012’ – the trip from Stuttgart to Göteborg after Jon had picked up his car following this year’s Gumball 3000. Enjoy. Alabama-based APR Motorsport has announced that it will be fielding a second Audi R8 GRAND-AM racer at the Six Hours at the Glen GRAND-AM Rolex Sports Car endurance classic on July 1. The #52 car, which will be piloted by Marc Basseng and Frank Stippler, will join the #51 R8 of Dr. Jim Norman, Dion von Moltke and Ian Baas. “It’s a great feeling to be running two cars with involvement from Audi Sport and with two of their factory drivers at Watkins Glen this weekend. We’ve enjoyed our relationship with Audi as their official launch partner for the GRAND-AM program,” said APR Motorsport owner Stephen Hooks. 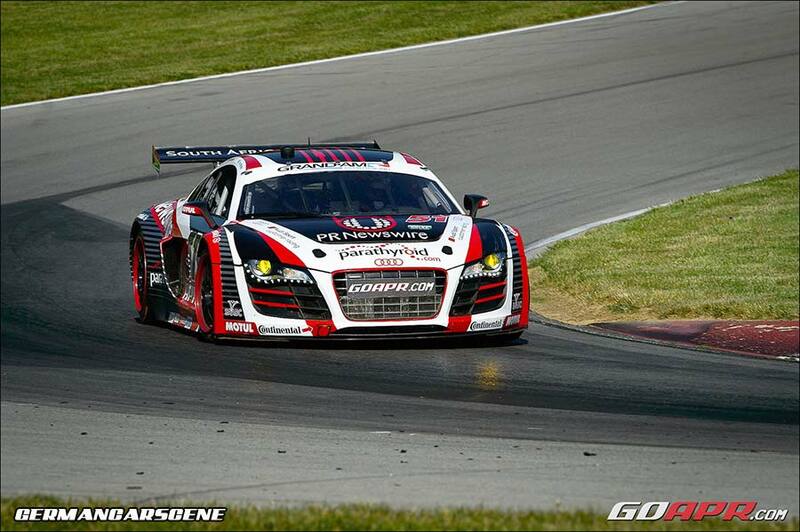 Based on the successful LMS GT3 racer, quattro GmbH has modified the R8 allowing to compete in the Grand Touring class of the GRAND-AM Rolex Sports Car Series in North America. Rules dictate that the ABS and traction control systems have to be disabled in the R8 GRAND-AM. Fans can keep track of the live timing and scoring at GRAND-AM.COM during every weekend event. 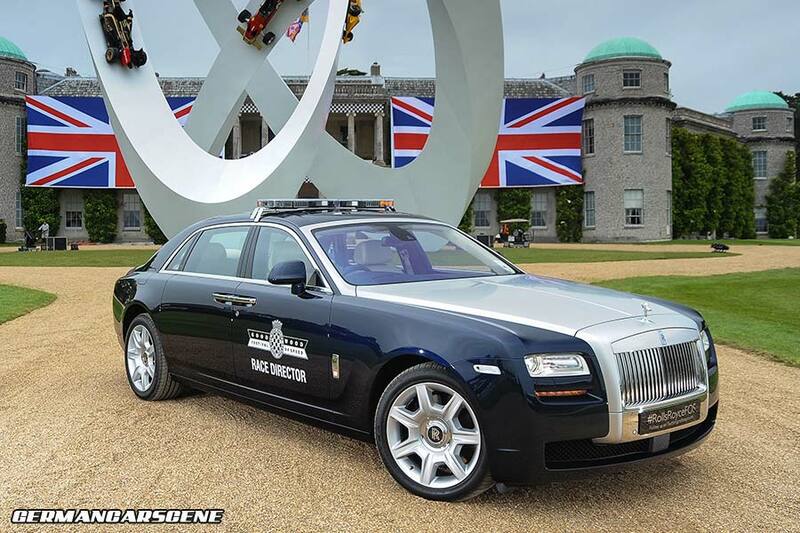 Rolls-Royce has announced that the Ghost Extended Wheelbase will be at this year’s Goodwood Festival of Speed, acting as the Race Director’s car. Powered by the company’s brawny 6.6-litre, twin-turbo V12 engine, which transfers its 420 kW (563 hp) and 780 Nm (575 lb/ft) of torque to the road via an eight-speed automatic transmission, the elongated variant is still capable of cracking 100 km/h in just five seconds. Painted in midnight sapphire with a silver satin bonnet, and wafting along on air-suspension with electronic variable damping, the occupants enjoy the benefits of a panoramic sunroof and hand stitched crème light and navy blue leather upholstery complimented by dark wenge veneer elements. Rolls-Royce has also brought along a blue velvet sparkle Phantom Saloon Series II press car, which will be stretching its legs today, providing VIP and media drives up the hill.